In an age of mass extinctions and climate chaos, can we reverse-engineer some aspects of our built environments to live in greater harmony with nature? Many of our cities are built on former wetlands, fighting a losing battle with erosion and the sea. We’ve lined important ecological corridors with concrete. We’ve hunted into oblivion many of the very species that could help keep the rest of the food chain in check. Much of our architecture is focused on shutting ourselves away from nature, as if we could escape it. But advocates for ‘rewilding’ say all we have to do to repair some of the damage humanity has wrought upon the Earth is let go of our obsession with control. The concept of rewilding has been around for decades, and it’s not necessarily a cohesive movement or concept, but rather a collection of related goals. Some define ‘rewilding’ specifically as the reintroduction of apex predators to certain regions, but just as often, it simply means allowing nature to take over far more often than we do. That might look like any number of things: removing sea walls and dams, reinstating river meanders, protecting certain marine sites from fishing and harvesting, allowing brownfield sites to grow wild after cleanup, making concrete channels more hospitable to wildlife or restoring floodplains. Of course, we still have to build things. We need housing, agricultural fields, industry and transportation infrastructure. A metropolis like New York isn’t likely to pack up and move elsewhere in the face of rising seas anytime soon. But many cities around the world are already taking small steps toward rewilding, whether they define it that way or not. 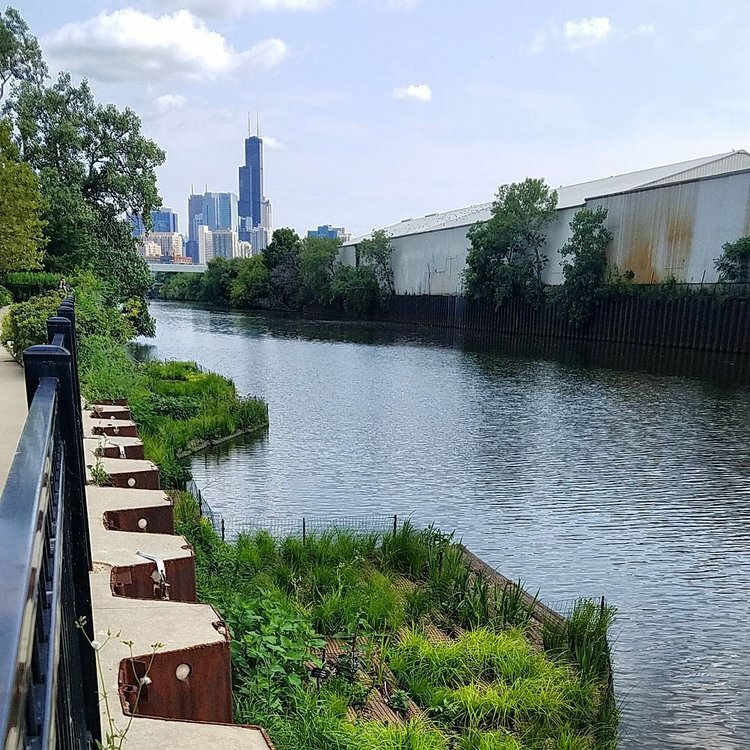 In Chicago, a nonprofit called Urban Rivers manages a project called The Wild Mile, which is in the process of transforming the manmade, steel-walled North Branch Canal of the Chicago River into a haven for wildlife. A few small sections are already complete, and by 2020, the canal will have wetlands, forest, walkways and kayak access points. The basis of the initiative is the creation of faux riverbanks anchored to the channel, made of coconut-fiber beds. The root systems reach into the water to filter and break down pollutants in this neglected section of the canal, and provide a place for mussels, birds and other species. The town of Dessau in Germany is shrinking. It never really recovered after its destruction at the end of World War II; it later became part of East Germany, its citizens mostly working in factories, but those industries ground to a halt when Germany was reunited in 1990. Many people left, and the residents left were mostly older. Before long, Dessau was essentially a ghost town, with wide swaths of empty parking lots and abandoned Communist housing blocks. The more it declined, the more people moved away. Instead of trying to lure people back in, the city’s government made an unusual decision: intentionally giving the land back to nature. 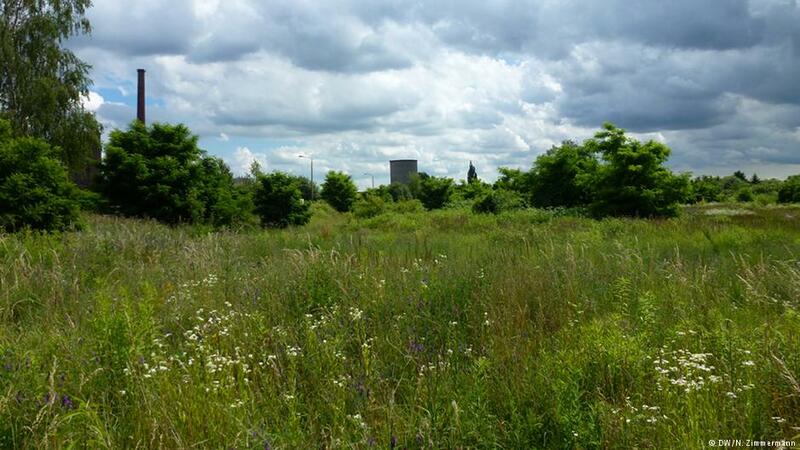 Many of the abandoned buildings were removed, and Dessau is in the process of buying up property along a nearly 300-acre belt that they hope to turn into a greenway – but they don’t have a lot of money for landscape design. Their solution mostly consists of wildflower meadows, which will grow into woodlands over time. Surrounded by water, with many sections built right on former swamplands, New York City will likely see the kind of flooding wrought by Hurricane Sandy more frequently in the near future. It was that particular disaster that prompted Rebuild by Design, a federally funded program that solicited shoreline restoration proposals from major architecture firms like Bjarke Ingels Group. 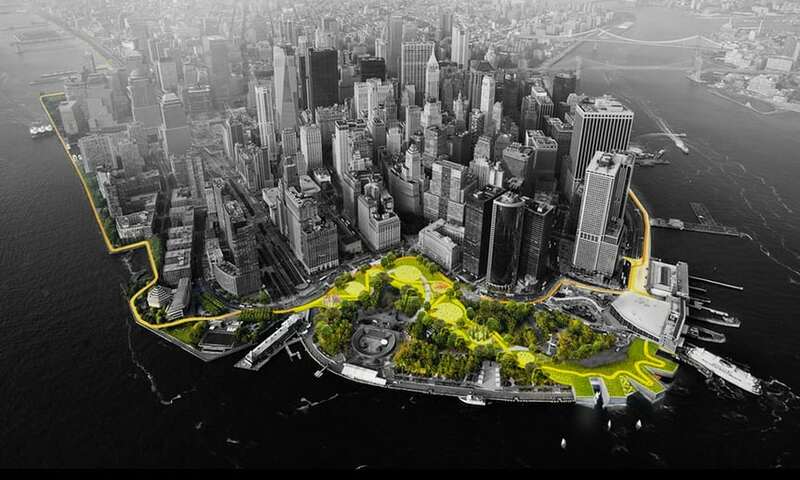 While many of the other submissions focused on areas like Staten Island and Hoboken, New Jersey, BIG’s Dryline proposal essentially wraps the Manhattan shore in 10 continuous miles of green carpet acting as a high water barrier. This “protective park” incorporates parks, bike shelters, skateboard ramps, seating and pavilions. 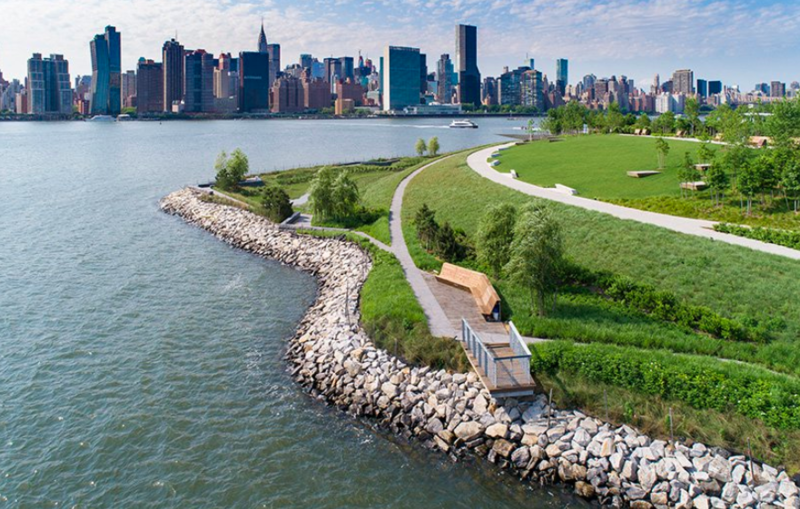 BIG’s vision may be – well – big, but whether or not it’s ever really built, similar buffers are popping up on a smaller scale, like the recently completed Hunter’s Point South Waterfront Park in Long Island City. Other projects managed by city governments are restoring beach dunes, removing intrusive infrastructure and restoring coastal habitats or constructing new wetlands to help anchor soil in place. 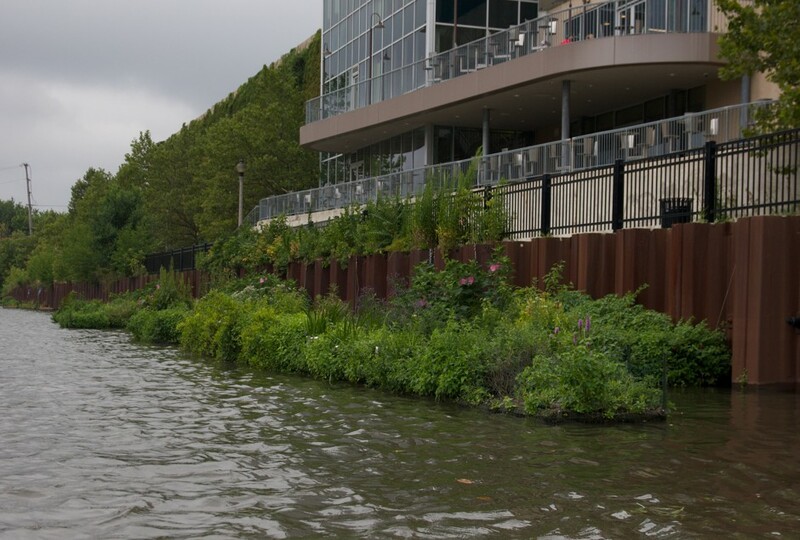 The installation of vegetated islands floating offshore could help break waves and host wildlife at the same time.